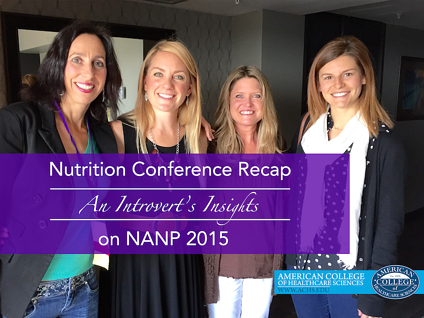 It was very inspiring to be surrounded by so many who share a passion for nutrition and holistic health. It was motivating to hear of the many ways those attending the Conference are devoting their lives to helping others with their training in holistic health. My approach in the holistic health field is a little bit different than the average holistic health professional. I currently own a dried flower farm and flower design business; my focus is on the beauty of flowers as well as their medicinal and nutritive properties. So I was encouraged to see that the speakers covered a wide spectrum of integrative health topics—including herbal medicine—promoting the “holistic” model of healthcare. There was an extensive variety of session topics available to attend at the Conference from nutrigenomics and functional medicine to self-publishing without debt. Bevin Clare’s lecture on the “The Smartest Medicine: Harnessing Co-Evolution with Herbal Therapies” was particularly helpful to me. Bevin has studied herbal medicine around the world and shared her remarkable knowledge of the power of plants that can be applied to consulting, natural product manufacturing, or teaching. As both a dried flower designer and holistic health professional, I am thrilled when I can use a flower for both my designs as well as for its therapeutic benefits. Yarrow Achillea millefolium (L.) grows abundantly in our area, and I use the dried flowers in my designs, so I was very excited when Bevin explained how yarrow A. millefolium is used all over the world for its many therapeutic benefits—one being a powerful detoxifier. I am grateful for the opportunity to gain knowledge that I can use in my own life and to also help others I may reach through my business. As Bevin is a clinical herbalist, nutritionist, and professor, I greatly respect the knowledge she shared as well as her recommendation of books and where to purchase high-quality herbs. As a graduate of the Wellness Consulting and Holistic Nutrition Consulting Certificate programs at ACHS, I would like to incorporate my holistic health training into my current flower and botanical business. And even though it is my deepest desire to help others improve their health and live healthier lives, I have an introverted personality that makes the “normal,” outgoing way of growing a business very stimulating and stressful. I was thrilled when I saw that Chen Yen was speaking on “The Introvert’s Advantage.” (She also gave a webinar on a similar topic for ACHS.) Chen shared marketing strategies specific to introverts, which was ideal for anyone in the holistic health field. It was inspiring to listen to Chen as she explained that being an introvert is actually an advantage, and this advantage is what customers, clients, and colleagues are looking for. Chen spoke about how we each have unique qualities and that we need to figure out what our "soapbox" is and share it with the world. Finding ways to share our passions is often very overwhelming for those with introverted personalities. She emphasized that we should focus on marketing strategies we are comfortable with and keep in mind that it often takes up to five connections with someone before they’ll choose your services. Listening to Chen motivated me, reassuring me that sharing our knowledge to the world in different ways is a positive thing. The more variety in our approaches to holistic health and nutrition will allow us to reach and help more people in our world. I never would have imagined so much nutrition and holistic health information could fit into three days. I am immensely grateful to ACHS for this opportunity. Because of the generosity of this scholarship, I am able to share the knowledge I gained at the Conference with others so it may be a blessing in their lives as it is in mine. Above Photo: (From left to right) ACHS graduate Lisa Powell, ACHS student Kellie Cooney, ACHS graduate Kimberly Konkol, and ACHS student Alyssa Zimmerman at the 2015 NANP Conference & Expo. Kimberly Konkol graduated with honors from ACHS in 2015 with Certificates in Wellness Consulting and Holistic Nutrition Consulting. Currently, Kim owns and operates a dried flower farm and design business, Everlasting Love of Flowers, where she designs dried flower displays as well as focuses on the medicinal and nutritive properties of flowers. She created the blog LIFE IN BLOOM, to share wellness information in a positive and uplifting way that she hopes will inspire others.